Ministry of Home Affairs (MHA) Intelligence Bureau is going to conducts the Examination of 750 posts of Assistant Central Intelligence Officer Grade 2 Executive . Check the information of Admit card and examination date. Ministry of Home Affairs (MHA) Intelligence Bureau had invited online applications 750 posts of Assistant Central Intelligence Officer Grade 2 Executive. The application process started from 11 October 2014 and last date was 09 November 2014. Large number of candidates who were interested and eligible for these posts had applied. Now the latest news is that Intelligence Bureau (IB) is in the process of conducting written examination for these posts. The written test is expected to be conducted in December 2014. Those candidates who had applied for these posts can download their IB ACIO exam admit card 2014 from the direct link given below after release. Selection Process - The selection of the candidates for the Post of Assistant Central Intelligence Officer will be done through written test followed by interview. Selection will be done on the basis of marks in both of these. Candidates qualifying both of these will be selected. Visit the Official link of the home ministry department and collect the ACIO hall ticket from here. Get the Admit card from here. 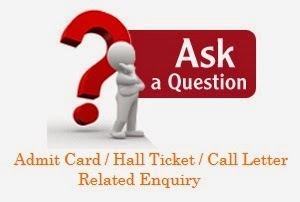 It is mandatory for all the aspirants who want to appear for the examination to bring the hall ticket. No candidate will be allowed to enter the examination hall without it. Aspirants can find test date, roll number, venue of examination etc. details on the call letter. Below you will find the details on how to download admit card of IB ACIO Exam 2014. Candidates can download their call letter by visiting the direct link given above. 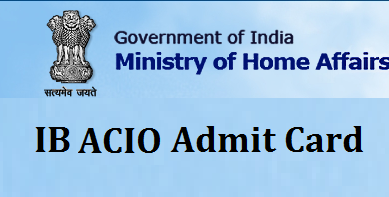 Click on the ACIO Admit Card download link. Enter your registration number and password and click submit. Your admit card of IB ACIO Exam will be displayed by the website. You need to take a print of it and keep it at a safe place and bring it at the time of exam. All details regarding examination centre, roll number etc. will be mentioned in that. Meanwhile IB Admit Card for ACIO exam can be downloaded from above link after release. We will update you after they gets released. Detailed Advertisement for the ACIO-II /EXE - 2014.